Even people who claim they don't like brussels sprouts pop these babies like candy. The key to this recipe is to roast the brussels sprouts until they're tender on the inside and golden brown and crispy on the outside. That way they're less cabbagey and more like vegetable crack. To make them even more irresistible, toss the sprouts in a tangy, sweet, and sticky balsamic glaze, then top them with parmesan and green onions. This side dish is great for casual dinners but could also steal the show at your next Thanksgiving. 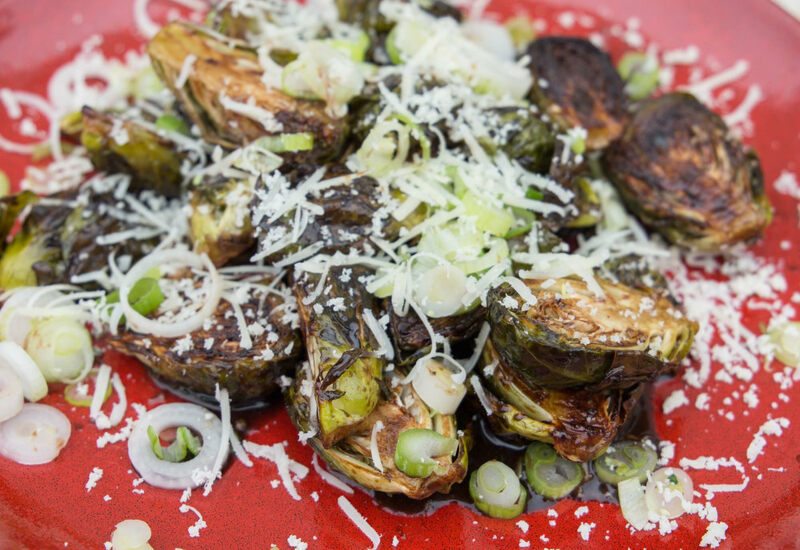 Once you've mastered roasting Brussels sprouts, you can switch up the seasoning. Instead of the balsamic glaze, toss the roasted sprouts in 1 tablespoon melted butter whisked together with 1 teaspoon sriracha and 1 teaspoon honey. Per Serving: 93 calories; 4g fat; 12.2g carbohydrates; 3g protein; 1mg cholesterol; 346mg sodium. YUM! These brussels sprouts were another delicious spin on the cruciferous veg I never, ever thought I could love. Even my kids are eating them! I love the tang, sweet, and savory layers. Only change I made: did not cook the glaze at all, just stirred it up and tossed with the sprouts right as they finished roasting - worked out great!